Babies, skin protection, and more babies! That’s what I ran into at this year’s Natural Products Expo, or #ExpoWest! Being pregnant, I was on a mission to find natural products and superfoods for baby and me. 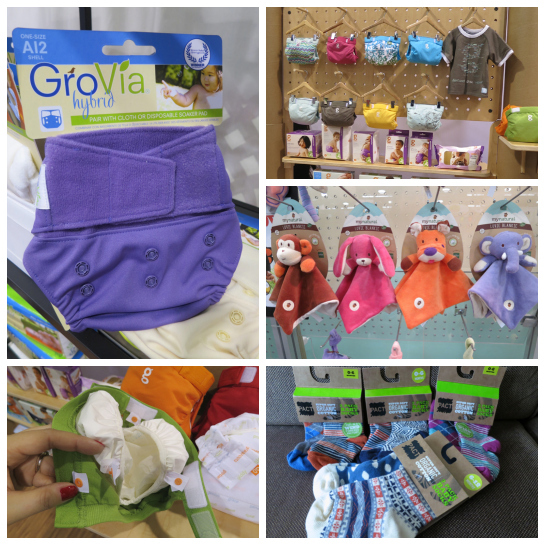 I found lots of companies that sold BPA-free containers for your snack foods as well as reusable diaper covers. My pal Sheryl is a cloth diaper fiend with her baby and learning about her experience has made me reconsider whether we should do cloth diapering for Spawn. The folks at PACT generously gifted me several packs of baby socks for Spawn. They source cotton from non-GMO farms with no fertilizers or bleaches. Â They didn’t have to do that. IÂ happened to be at their booth, asking about where to find their products, and boom – insta-socks! Next up, I met many exhibitors with natural or organic skincare. I didn’t really give much thought to what I was putting on my body untilÂ about two years ago. Baking SpawnÂ has made me more aware of natural products companies as well as green-washing. 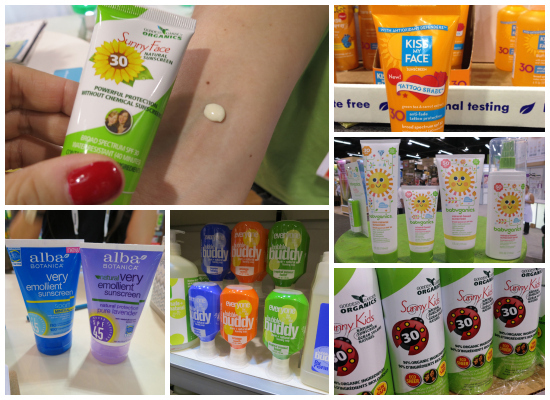 At #ExpoWest, I ran into many sunscreen products as well as regular skin care products like Goddess Garden Organics, Kiss My Face, Coola, Alba Botanics, and EO’s new Everyone line. Some exhibitors were friendlier than others. Some, like Goddess Garden and EO, were more than helpful and open about what was in their products. Sidenote: I took Goddess Garden Organics’ sunscreen to Maui and thank goodness I did. IÂ slathered plenty of sunscreen all over my baby bump and tattoos as well as The Wife’s chest and back. He tends to get sun poisoning, and it’s not pretty. Verdict: It goes on thick and I don’t have to worry much about reapplying. I’ve been using Earth Mama’s Natural Stretch Oil and it is fantastic. The scent is nice and not hippie-dippy. It’s just nice to rub on the belly and then relax in bed. 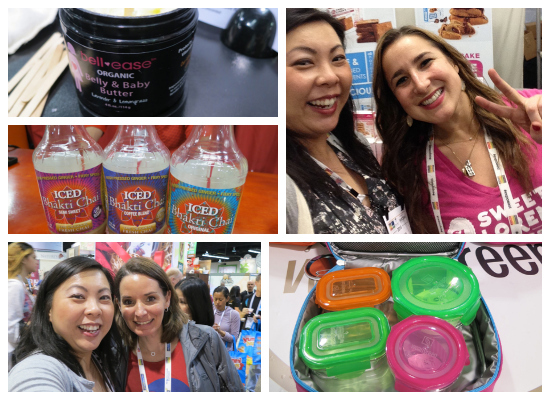 I ran into many woman-owned businesses during my two days at ExpoWest. It was amazing! Earth Mama is one. So is Goddess Garden Organics. So is Melt. But wait there’s more. Do you like cookies? Sweet Loren’s is owned by a woman. Wean Cubes? Woman- owned. My favorite iced chai tea by Bhakti Chai? Woman-owned. Bamboobies? Yep. Woman-owned. I was in heaven. Do you know how inspiring it is for any woman or girl to attend a massive expo like this and meet so many woman entrepreneurs?? These women could fill a whole conference on just entrepreneurship and business operations! This was my third year attending the Natural Products Expo, and I continue to be wow’d by companies offering non-GMO, gluten-free, vegan, vegetarian, fair trade, or plain ol’ eco-friendly foods and products. The older I get, the more concerned I am with the quality of food products The Wife and I take in. Now that we have Spawn to think about, I’m starting to become Mama Bear. (I have the cankles to prove it. *sigh*) I want to protect our baby – from the blazing sun to the detergents used on her clothesÂ to the formula she may take. Don’t get me wrong. I ain’t no hippie. (B*tch please, would a hippie save her money for a year to buyÂ a Louis Vuitton Neverfull? I think not.) I’m also aware of green-washing and companies slapping the “all natural” label on things that aren’t really all natural. You have to do your due diligence. Note: I’m not giving up my Coca-Cola, but I definitely care more about what goes in my body. Life’s too short to eat crap every day. Once again, I’d like to thank the Natural Products Expo team for granting me press access and letting me cover the long weekend. I also want to give applause to many of the companies that were out exhibiting – small or large. It’s imperative that the average American is aware of companiesÂ that do produce good foods and products that are tasty and not filled with artificial ingredients or harmful additives. Disclosure: This is my honest opinion and recap of the Natural Products Expo 2014. Post contains affiliate links. Previous Post: « Dermalogica Skin Care – Review – Cleansing Oils? WTF? Always appreciate your Natural Expo product reviews. I’m always on the look out for new natural products. Did Goddess Garden Organics mention where you could find their products – probably the usual Sprouts or Whole Foods I bet. Also, “hippie-dippy” LOL love it.